The W stands 7ft tall and is painted aluminum. The concept of neighborhoods worked especially well for the UW campus because they are part of the local Seattle cullture. A signage prototype for the yet unbuilt UW master wayfinding plan, using local sandstone and a blend of campus gothic and contemporary styles to achieve a look consistent with all campus buildings. 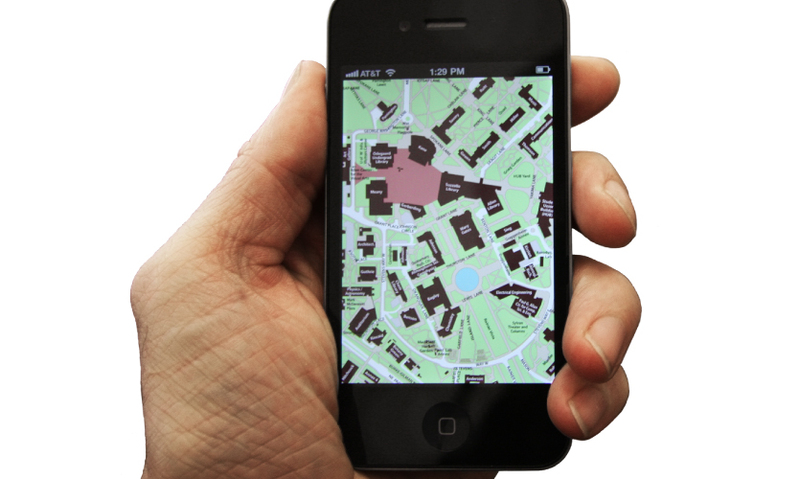 MCD also developed a “Maps to apps, web to wayfinding” One Map strategy to aid wayfinding, replacing multiple maps with one map (art) used on Directories, printed maps and mobile devices. 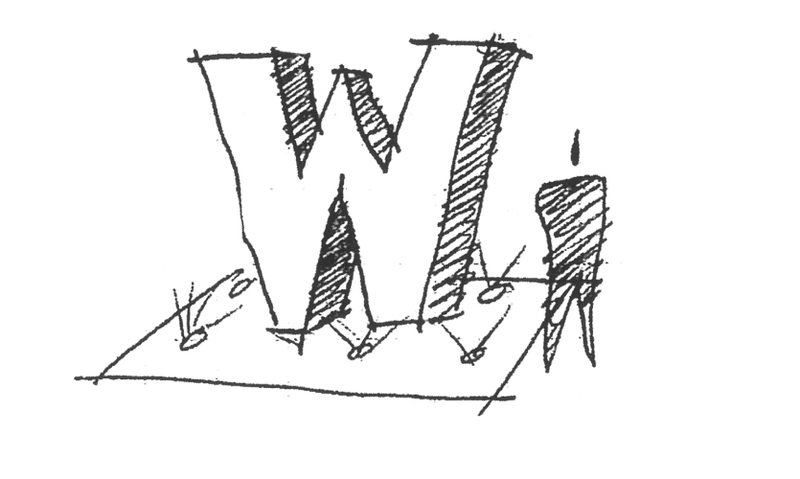 The thumbnail sketch which launched the "Big W"
Installation of the W onto the base, which was designed by the university staff. Bronze was the preferred look for the monument, but the most efficient use of materials turned out to be an aluminum framework with an aluminum shell, painted to resemble bronze. 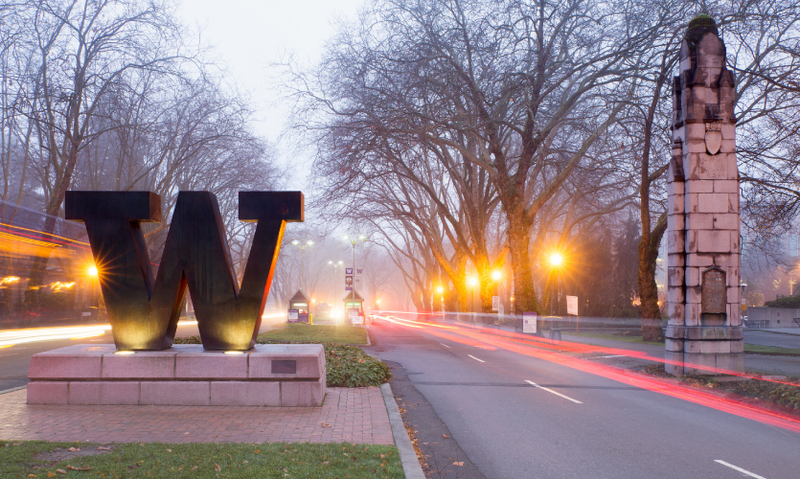 The “Big W”, as students like to call it, is located at the primary entrance to the main campus of the University of Washington. 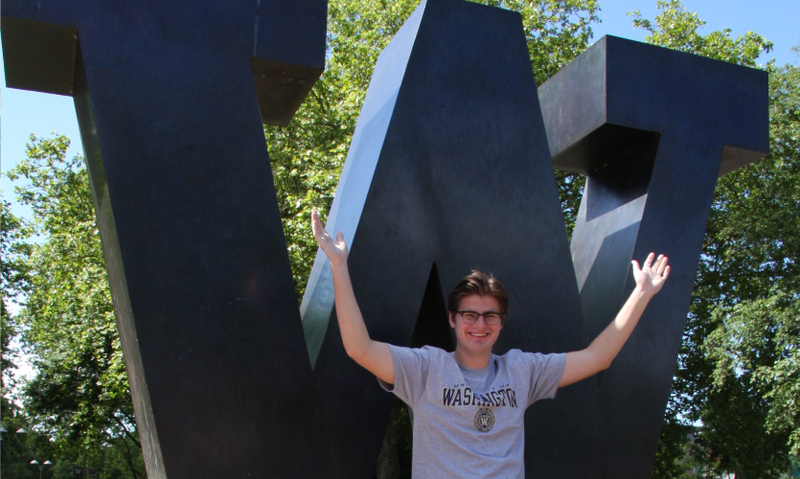 The success of the big W became apparent in a number of ways over the next few years, from the proliferation of UW-branded clothing featuring the same W mark to the installation of additional landmarks on UW's campuses and the many photographs of it. "We frequently hear from people professionally and socially how much they love the W," remarks Courtney. "They often pull out their phone to show us the photographic proof." MCD contacted their PR firm and UW a few weeks prior to commencement in May 2016 with an idea for a graduation-coordinated social media campaign: #MyBigW. 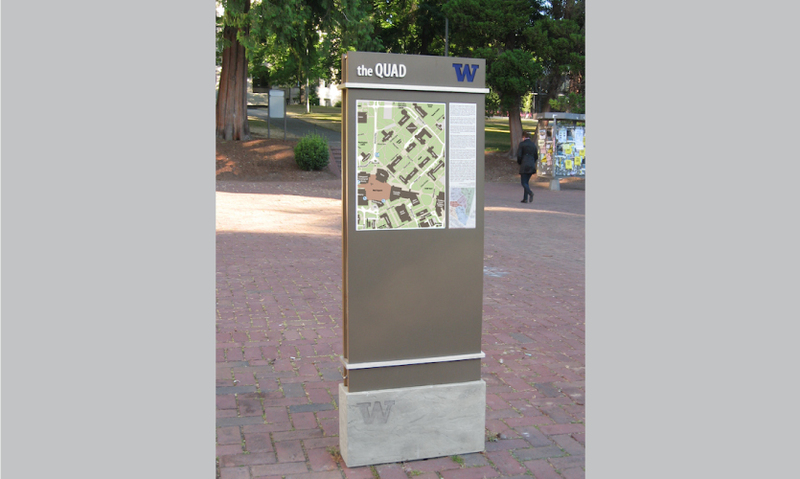 Michael Courtney Design (MCD) (Seattle) had begun working on a master wayfinding plan for the University of Washington when the team was issued a challenge from the president of the university: Design an element intended to connect with a broad range of people. The University of Washington is largely regarded as a "Public Ivy" and consistently ranks amongst the top universities in the world. It is a beautiful, hilly 643-acre-campus boasting over 500 buildings and 44 thousand students. 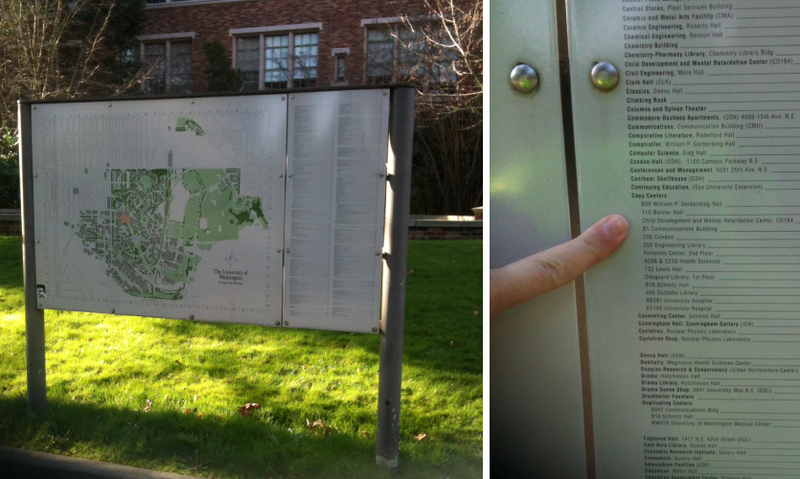 UW has an existing sign system that hasn't seen maintenance as the university added buildings and departments. The campus is lushly landscaped, blocking traditional sightlines, and it is not built on a grid, further complicating wayfinding conditions. 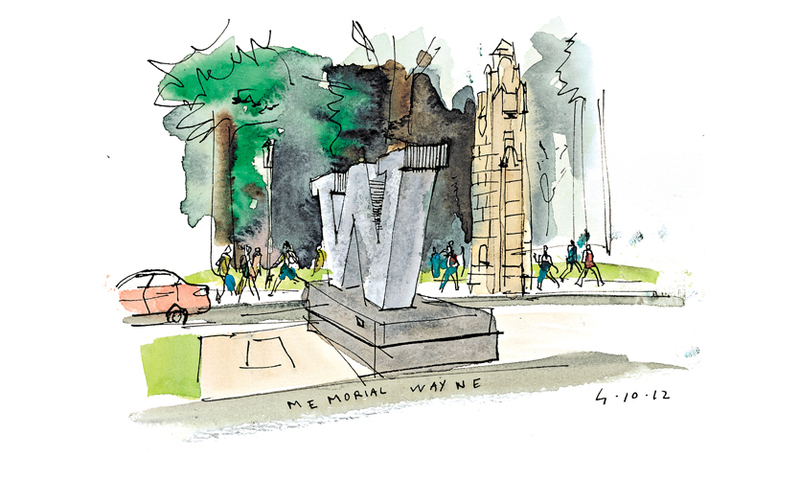 Pre-2010, the gateways to the university were without fanfare; the main entrance was only marked by a low stone wall with a University of Washington wordmark in six-inch lettering, obscured by creeping greenery and flanked by two starkly formal obelisks. MCD identified two issues at the projects start: keeping the number of signs and messages to a manageable level and identifying the main entrance to campus without adding dozens of destinations to campus buildings. The solution to the first issue was solved using local Seattle culture. “Neighborhoods are very much a part of the cultural vernacular here," remarks Michael Courtney, Principal-in-Charge and Creative Director of MCD. 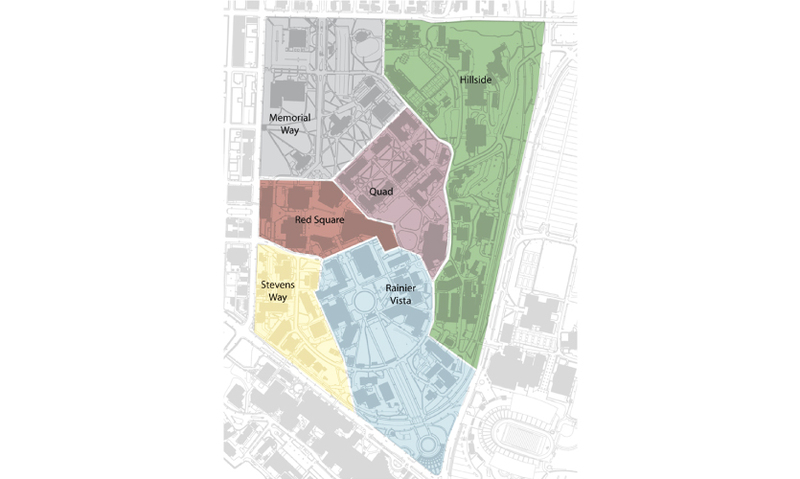 "We proposed dividing the campus into neighborhoods which would allow us to identify ‘zones’ recognized by students and staff—such as ‘The Quad’ or ‘South Campus’—to enhance wayfinding and keep the number of destinations on the signs to a manageable level." 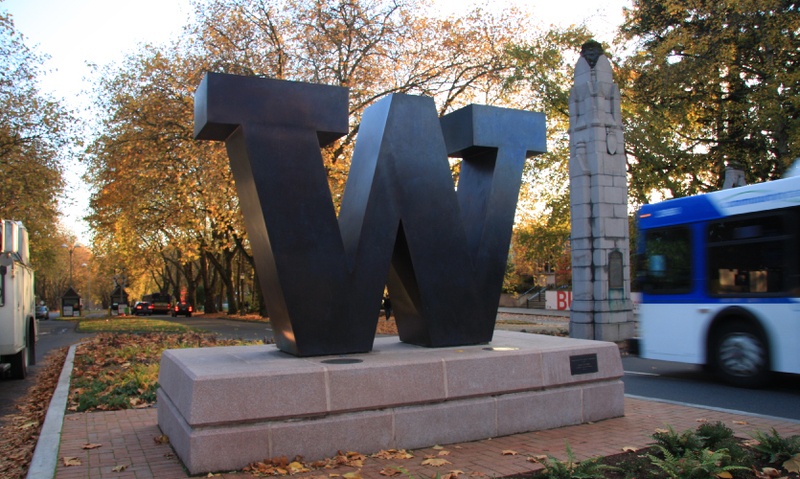 UW had recently introduced a bold, blocky "W" as part of a rebranding the marketing department was spearheading. Michael Courtney zeroed in on it in the midst of the meeting. "I suggested the 'big W' as the gateway monument, and the committee wanted to know what it would look like,” said Courtney. “So I did a little one-minute thumbnail on the spot." The thumbnail was effective—everyone at the table loved the idea—but it wasn't clear how to get that specific part of the project funded. Two weeks later, things had been fast-tracked thanks to an alumni group looking for a project to support. The MCD team quickly put together construction drawings for the seven-foot-tall W, and the project went out to bid. Meanwhile, the master plan project was unexpectedly on hold. Bronze was the preferred look for the monument, but the most efficient use of materials turned out to be an aluminum framework with an aluminum shell, painted to resemble bronze. 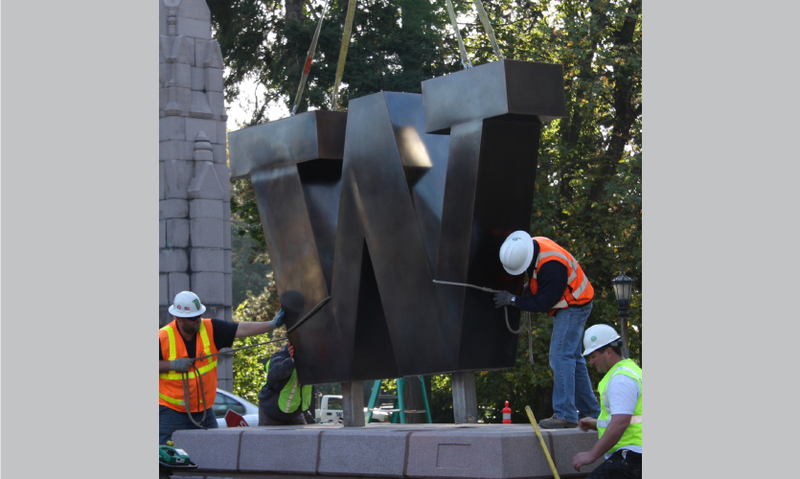 This construction allowed for a relatively easy installation using a crane to hoist the W onto a concrete base (designed by the university). The interior was specially coated to prevent noise and reverberation. 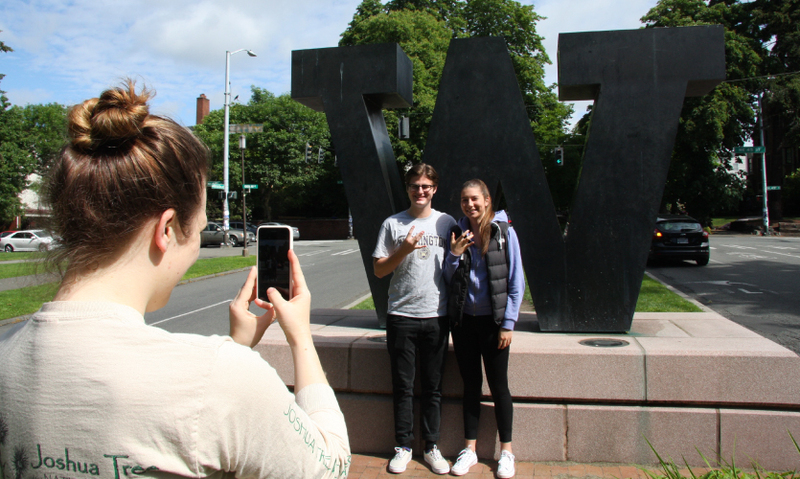 The success of the big W became apparent in a number of ways over the next few years, from the proliferation of UW-branded clothing featuring the same W mark to the installation of additional landmarks on UW's campuses and the many photographs of it posted to social media. There was no shortage of anecdotal evidence that MCD had succeeded in creating a photogenic and distinctive landmark for the campus, either. The MCD team, as EGD practitioners, wanted to find another metric to quantify their results and track user engagement. 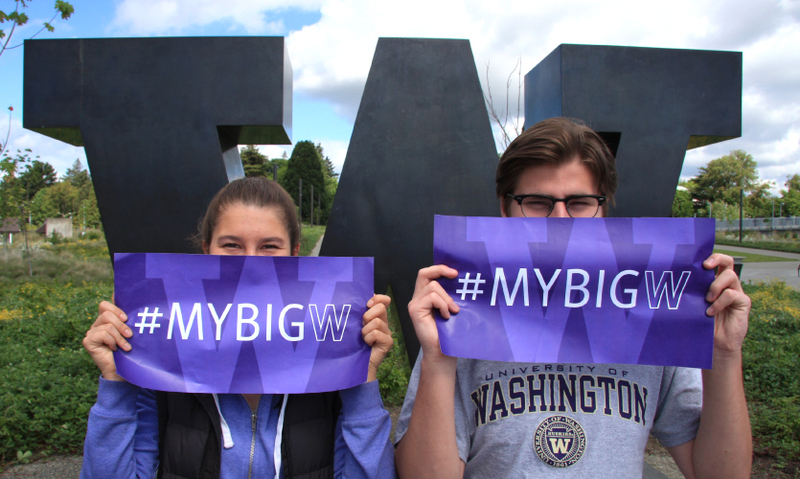 They contacted their PR firm and UW a few weeks prior to commencement in May 2016 with an idea for a graduation-coordinated social media campaign: #MyBigW. The use of the word "my" intentionally gives alumni, students and family a sense of ownership over their education, experience and, of course, their photo with the monument. The timing was too tight for the university to contribute to the campaign, but they were supportive of the #MyBigW Instagram photo contest. However, for the MCD team, the concurrence of the campaign with graduation created the perfect occasion to raise awareness while families were visiting and photos were being taken. "The easiest way to reach out to students on Instagram and create awareness for the contest and hashtag turned out to be simply commenting on their graduation photo with #MyBigW and 'congrats!'" remarks Lizzy Skolmen, a Designer at MCD. Deciding against using printed posters or ads in the campus daily newspaper, they focused on places where students communicate most, running inexpensive paid ads on Instagram and Facebook, as well as setting up a geotag and filter for Snapchat, for a mere five dollars. "During the competition, we used Snapchat to reach out to our audience. It was an easy and fairly inexpensive way to engage the students. The students could select the filter for their snaps that they would be sending out to friends. The filter itself featured a purple W and the hashtag #mybigw," says Skolmen. First, second and third prizes were $100 to UVillage (a lifestyle center near campus), postcards printed with the photo, and a commemorative wood print, respectively. The MCD team's experiment with social media engagement allowed them to gauge success in a new and meaningful way. Their campaign received a variety of enthusiastic submissions from participants, and it was in the nature of those responses that the team began to understand the impact the project has had on the community. 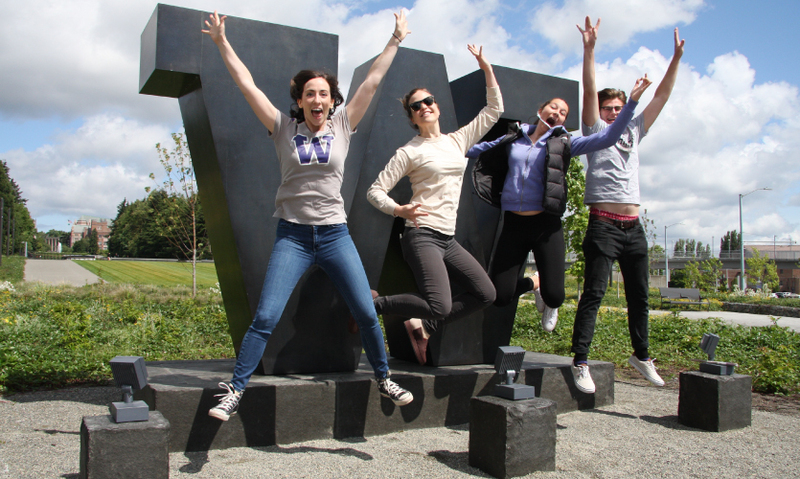 From fifth-generation UW alumni to first-in-the-family graduates, the W resonated across different contexts, facilitating connection, self-expression and a sense of pride. Perhaps the best measure of success is that MCD plans to run the contest again next May, building on last year's results. 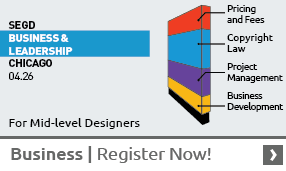 Even better, they have an exceptional user-engagement case study to share with their clients.